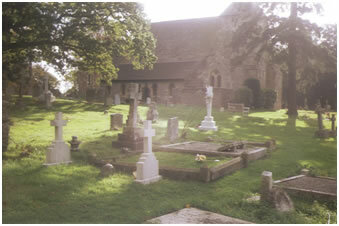 ST.JOHN THE BAPTIST Is situated on one of the highest points in Westfield standing significantly on the corner as you enter the Village on what is now the A28 Hastings to Ashford road.The location, some distance from the present village centre, is often attributed to the Black Death but this is not the case. 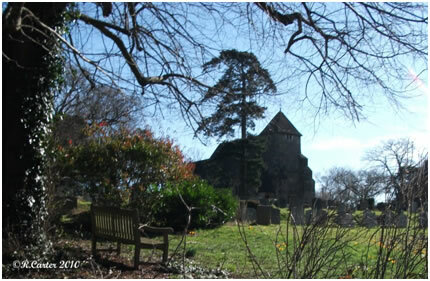 The building is of Norman and Early English heritage connected in the first instance to Battle Abbey.Having made long indepth research (with confirmation by archaeology experts) there is no evidence to suggest it has any Saxon origin.The earliest confirmed date is shown at the time when, with the Church at Westfield William FitzWibert the donor, gave all customs appertaining to it. Among these was that singular one Ordeal by Water*. 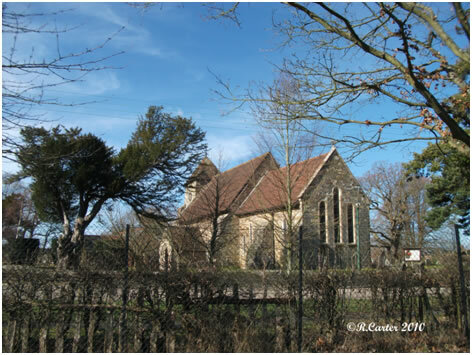 Ralph Bishop of Chichester (1091 – 1123) in his Deed of Confirmation of this gift adds: “and I grant the *Ordeal by Water which by a certain legal right belongs to that Church. I wish moreover and strongly maintain that as to the aforesaid Ordeal by Water no one should administer it other than the Abbot of Battle and his Monks. As a test of innocence or guilt water ordeal was practised by means of both hot and cold water. In the former of these two ordeals the accused standing before a vessel of boiling water was made to plunge his bare arm into it and he was pronounced innocent or guilty accordingly as the arm, when withdrawn was found to be scalded or not. 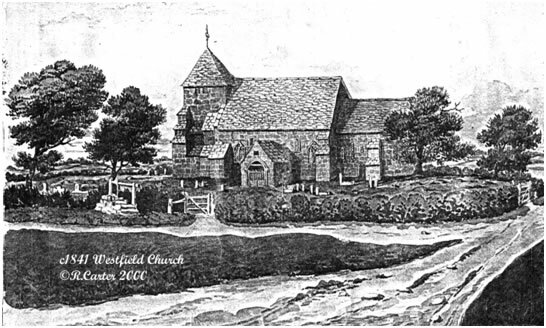 In the latter which would have applied to Westfield if used, the accused was thrown into some deep part of a pond or river where if he struggled in the least to keep himself floating on the surface of the water he was counted guilty; but if he swam without effort or omission on his part he was honourably acquitted. Water ordeal was usually applied to the commonalty. The nobility were tested by fiery ordeal. 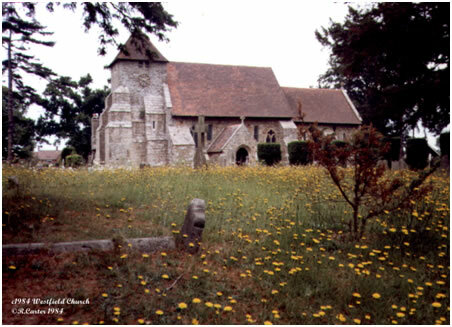 Abbot Walter de Luci (1139-1171) one of the Abbeys administrators bought the Church at Westfield and its wist (fields etc) consisting of approximately eighty two acres. 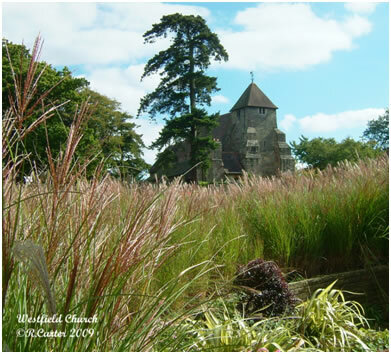 The monks occupied the moated property situate nearby (formerly Westfield Manor) now Church Place Farm. 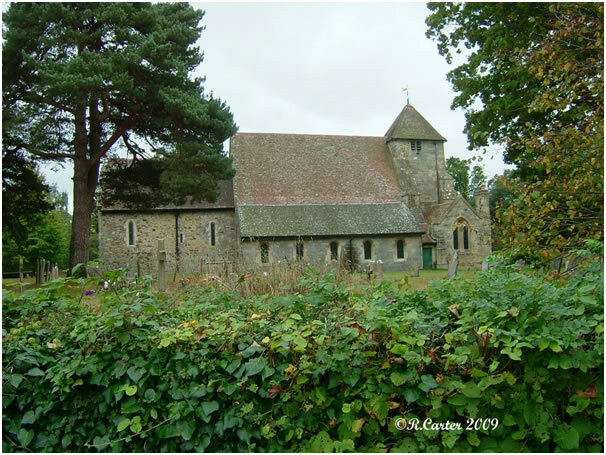 In 1291 Richard Bishop of Chichester allowed the Abbey to appropriate the tithes of Westfield, the Monks paying to the Vicar 100s only besides one pilch or furred garment and decent clerical coats. 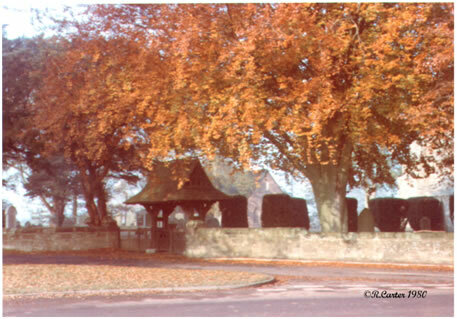 8 October 1583 to John Hopton; 13 March 1589 to William Maudesley and 25 November 1597 to William Bond. 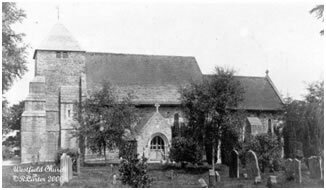 At the beginning of the following century however, the advowson was again in the possession of the Sackvilles and the Rectory also held of the Bishop of Winchester. Richard, Second Earl of Dorset appears to have conveyed the advowson to the Bishops of Chichester who have since held it. 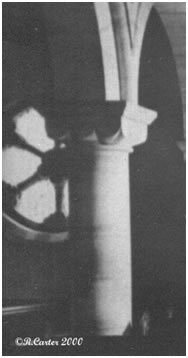 ornaments of the Church the sum of 36s. 4d of which ornaments I have put forth to sale one vestment for 20s. which said 20s. if my Executors can get and come by it. Then I will that the residue which 16s. 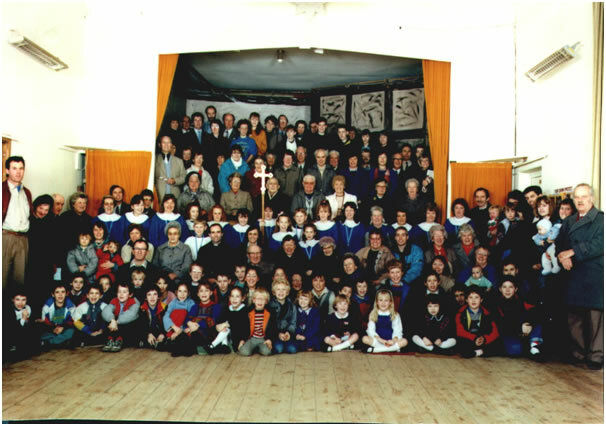 4d shall remain to the church to serve the said parishioners." 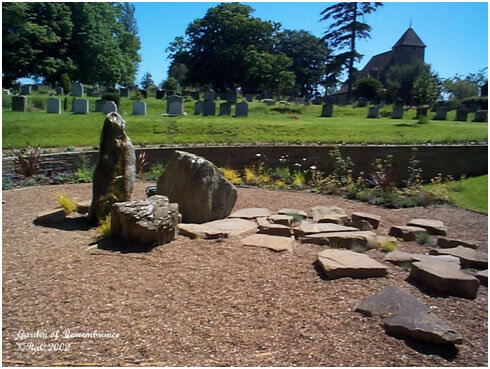 Construction in yellow sandstone of somewhat uneven quality is associated with Hastings being used for two ancient churches and the castle. 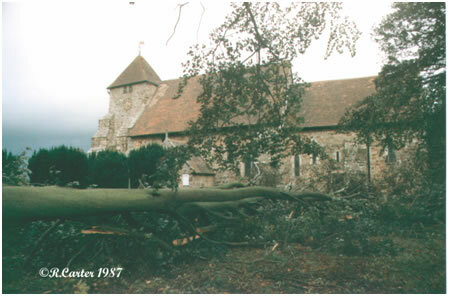 It was employed in the Building of the churches at Battle, WESTFIELD, Sedlescombe, etc. being dug from many places in the hills around Hastings. “Sit Nomen Domini Benedictum” – “Blessed be the name of the Lord”. The second bears inscription: “Fili Dei Miserere Mei. Io. Wither, Vicar; I.Dien. L.Eavrey. 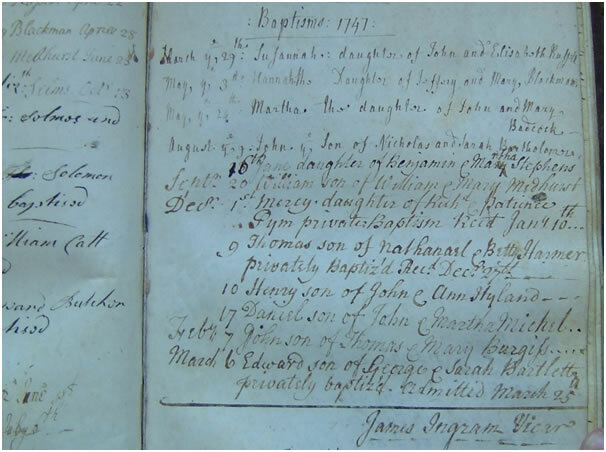 R.Thomas, I.Parker.Wardnes.1698 “O Son of God have mercy on me” John Wither, Vicar with the names of the Churchwardens and date. John Wood made me, 1699 “Glory to God” (John Wood had a foundry at Bishopsgate). 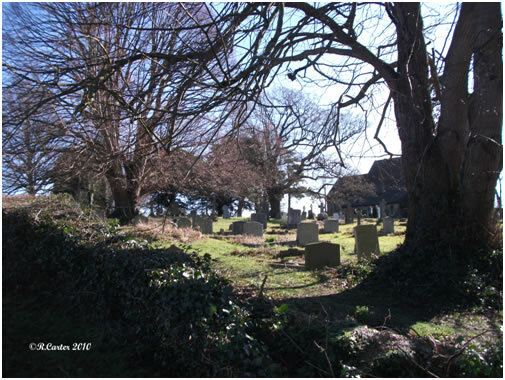 Due to travelling conditions many bells were made 'on site'. 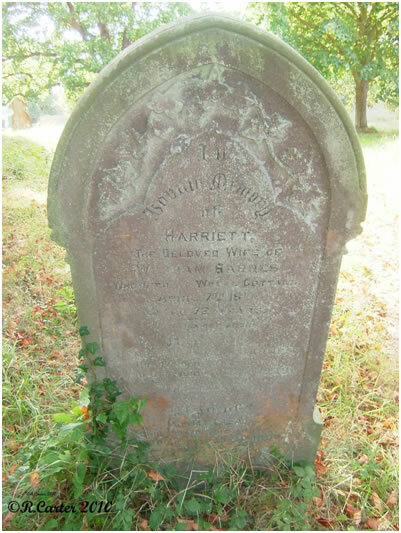 There appears an indentation in the churchyard which might be attributed to this. 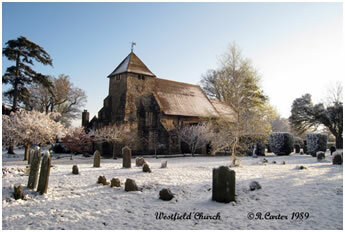 During the late 13th early 14th century a wall painting of ST. GEORGE existed in Westfield Church. This has been destroyed. 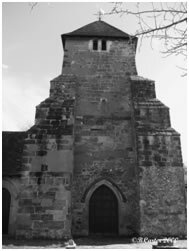 Early architectural features to this Church include extensive buttressing, a 12th-century porch and a 14th-century font with an elaborate 17th-century cover. 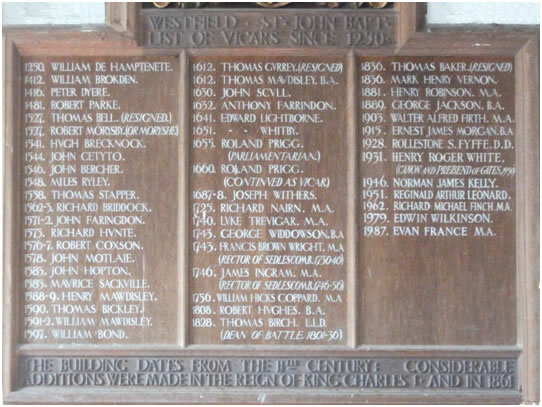 Above the door to the tower there is carved a Royal Coat of Arms with the list of vicars since 1250 set below. 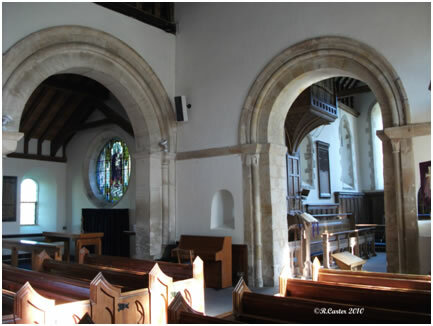 Looking towards the nave there is a Norman arch with squint windows to the side, cut through the 32 inches of stone. 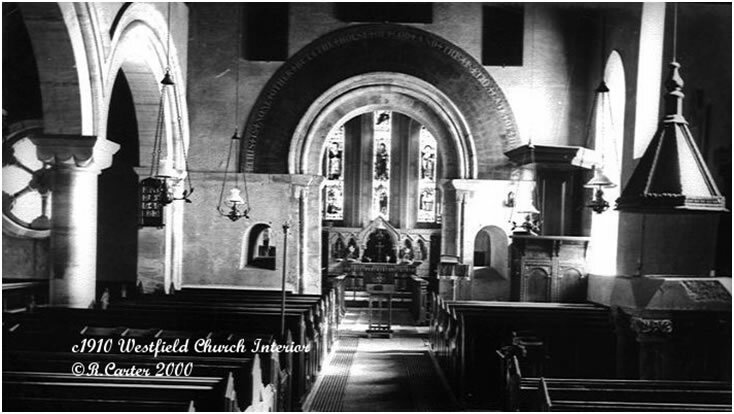 On the 8th, at 11 o'clock a.m. there will be Divine Service in the Parish Church, when it is hoped that the Bishop will give a short address. All parishioners are invited to be present if possible. 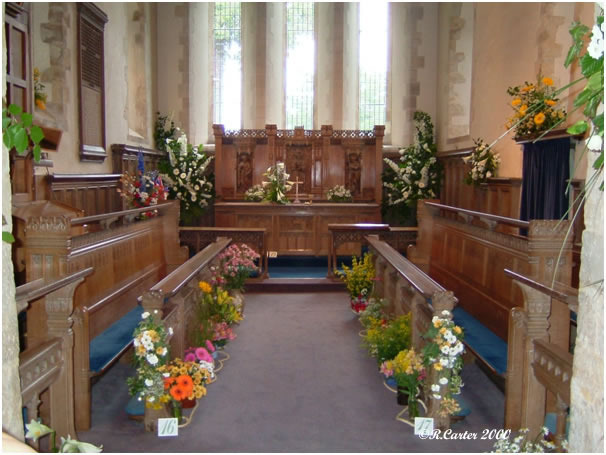 After Service the Bishop will proceed to the Dedication of the new Altar, the Lych-Gate, and Vestry, and the Consecration of the addition to our Churchyard. Mr. Alfred Easton has been kindly lending his American Organ for the Church Services during the Restoration of the Chancel. We here take the opportunity to publicly thank him for the loan. 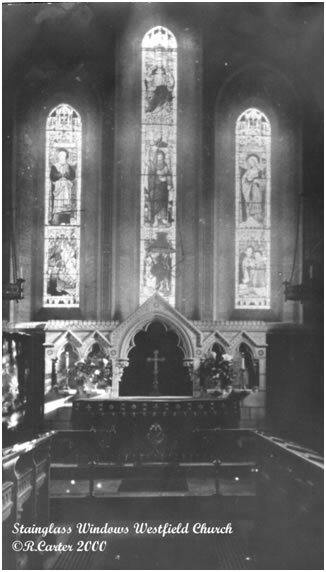 Stain glass windows above the altar were shattered in a bombing raid in 1944. 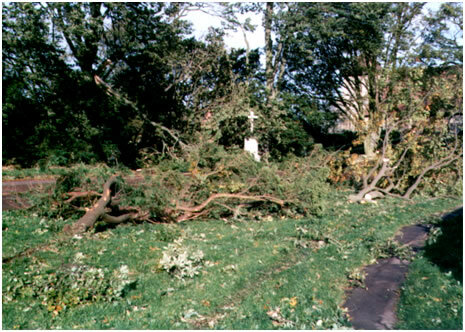 The plain glass replacements allow nature to be clearly observed. 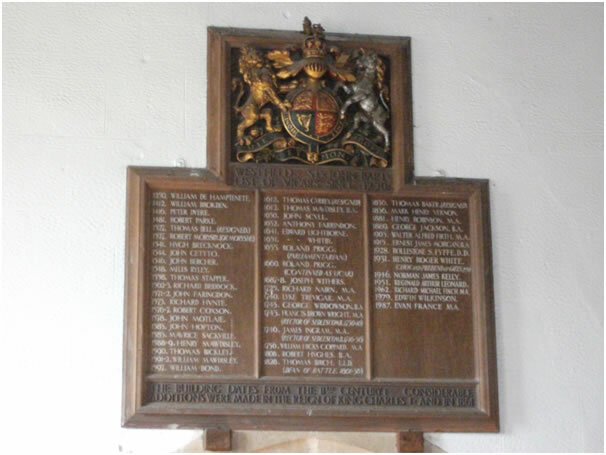 The marble reredos (the remains of which we found in the Old Vicarage garden), was replaced with the present one of oak given by Mr. Beale Brown of Westfield Place in memory of his wife. 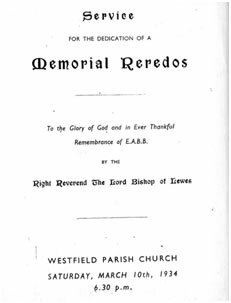 At 6.30pm on Saturday March 10th, 1934 a Dedication Service was held: "In the Faith of Jesus Christ we dedicate this Reredos in memory of Ethel Alexander Beale-Brown, in the Name of the Father, and of the Son, and of the Holy Ghost. 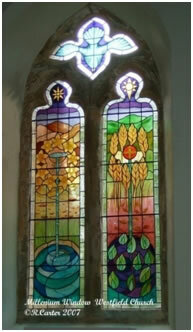 Amen"
Installed in 2000 the Millenium window replaced one of plain glass. 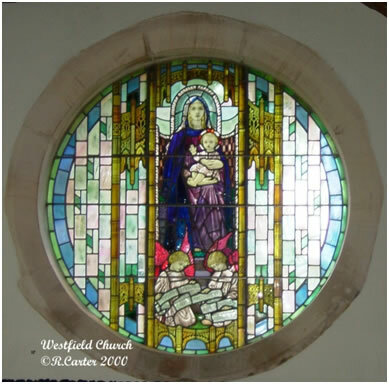 Prior to this a stain glass window in memory of Harry and Mary Jane Coghill destroyed by a flying bomb in 1944 had been in this location. 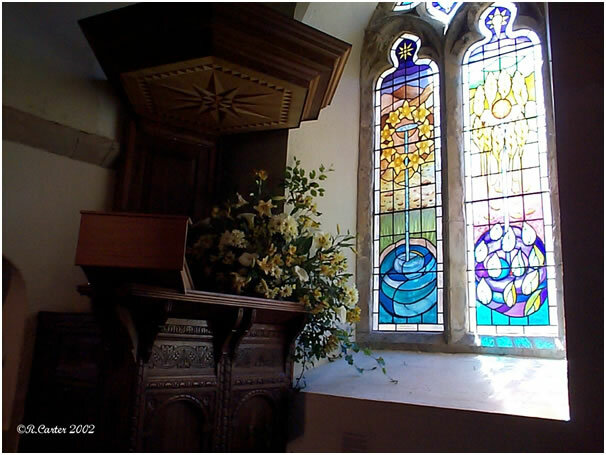 The Jacobean pulpit is now often bathed once again in colourful sunlight. 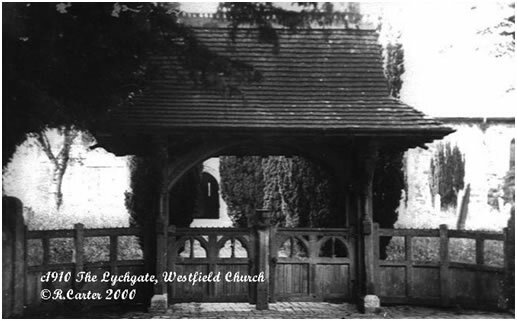 Main entrance to the churchyard is via an attractive lychgate erected in 1888 as a gift by H.Barton Webb.The cost £230. 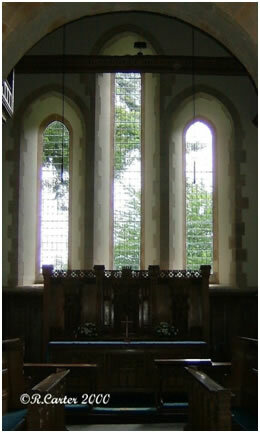 Four angels guard each corner. 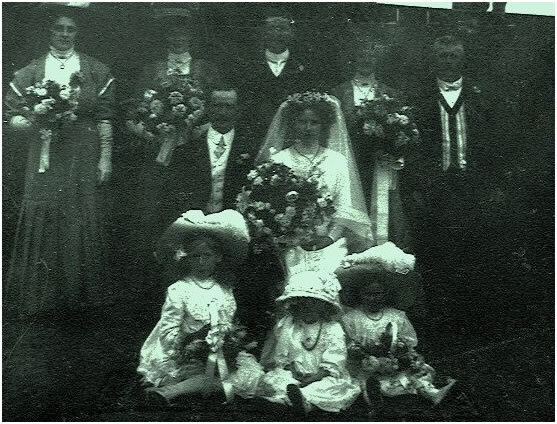 Mortified that their son had defaced these by cutting their noses off, one family left the Parish in disgrace! 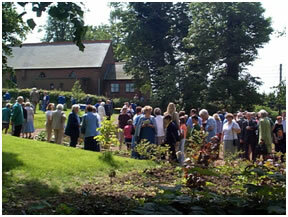 "The weather was superb for the Jubilee service and the church was full of people who had come to celebrate the occasion. 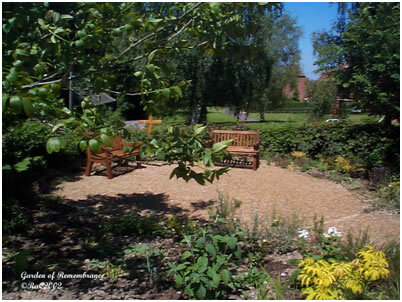 After the service we trooped down to the new Garden of Remembrance for the dedication ceremony. 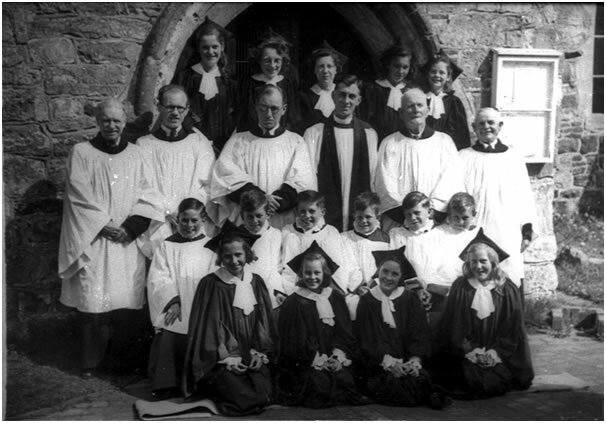 The choir sang, the Vicar splashed water around, we prayed, we enjoyed the sunshine and we drank a glass of wine. 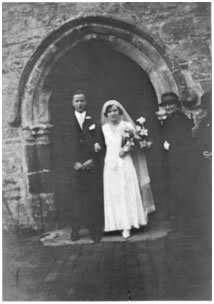 Many thanks to everyone who came"
Transcripts of the Parish Registers, Memorial Inscriptions and other records have been undertaken. Since 1980 these have been made available to many locally, nationally and worldwide for research purposes via personal contact. 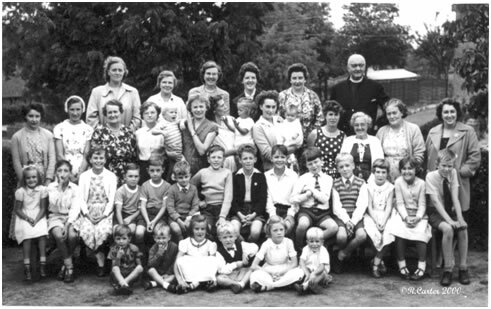 Many people have been successful in finding generations of their family and have appreciated the facilities that have been offered to them. 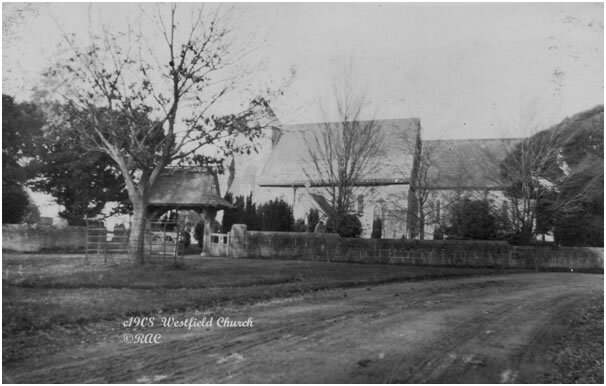 If you are researching ancestors from Westfield contact Ruth: ruth@westfieldhistory.co.uk for further information. 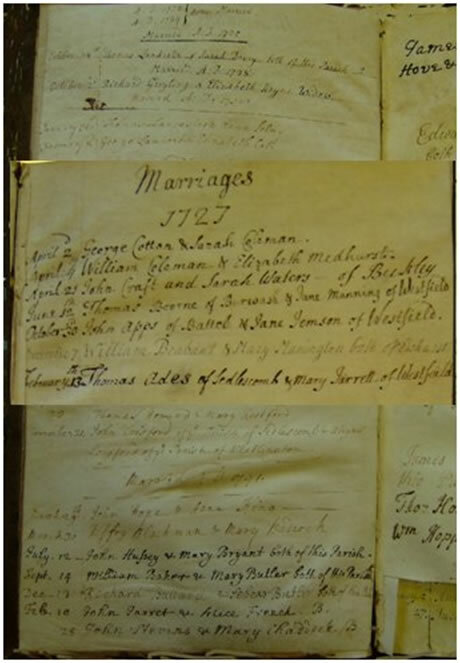 "Edward and William and Barbara, the sons and daughter of Edward Ransom all born at one burden were baptised on 4 July 1624". The first seven parchment leaves of the Baptism Register from 1586(?) 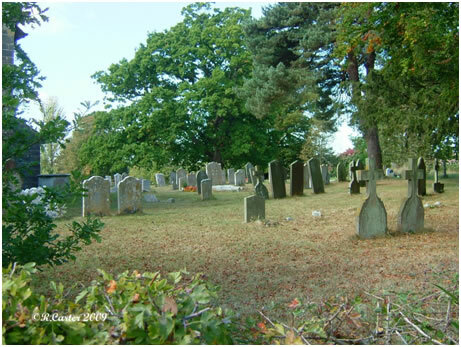 to 1614 have been "much eaten" by mice or rats and the number of complete entries during this period varies. 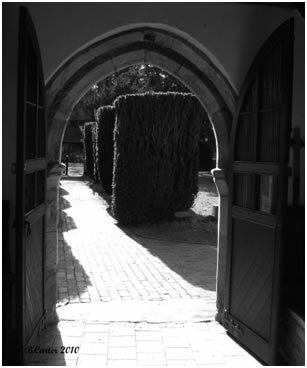 We are fortunate to have entries taken from the Bishops Transcripts the earliest of which commenced in 1608. 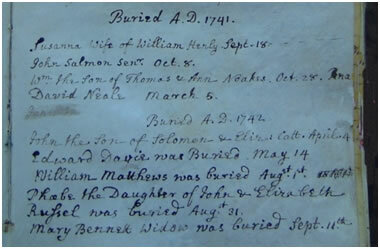 FAMILY BAPTISM & BURIAL on the same day in 1638! 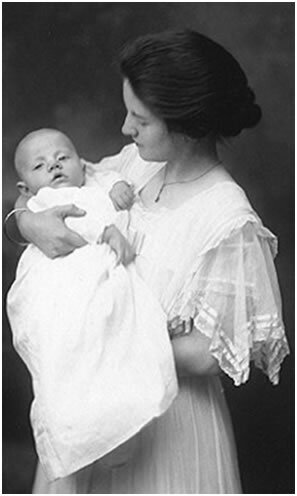 his father and mother were both buried." 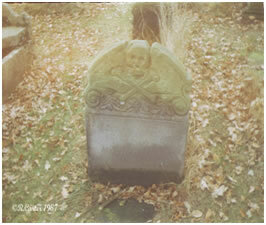 travelling unto Westfield was buried - 18 April 1636". "The Day Thou Gavest Lord Has Ended"